Let me begin by asserting that sustainable finance, social and environmentally responsible investing will escalate to the forefront of global thinking, speaking, doing and capital. Sustainable and responsible finance and investing represent the sole financial solution to save people, planet and profit. My own particular dedication is to water security, a sector that I am immersed in. Once I discovered the gravity of water risk it became a calling that burgeoned into a passion. What is financial water risk? Physical and financial water risks are the greatest threats to people, planet and profit. In an October 2017 report ‘Asset & Wealth Management Revolution: Embracing Exponential Change’, PwC anticipates that global Assets under Management (AuM) will almost double in size by 2025, from USD84.9trn in 2016 to USD111.2trn by 2020, and then again to USD145.4trn by 2025. All of these assets are either directly or indirectly exposed to financial water risk. Financial water risks are increasingly material. Climate change and other drivers are turning water into a scarce commodity, increasing competition for available resources and making protection of water quality more vital than ever. These risks have to become an integral part of investor research and risk management processes and daily financial decisions. Otherwise, investors will be blind to a risk that is only continuing to grow. Asset managers require transparency to make decisions. Typically, water risk transparency is based on share pricing, curated corporate financial accounting and voluntary disclosures of environmental risk attributes. Indexing financial water risk allows the asset manager to extract a probabilistic financial indicator of corporate and portfolio risk to facilitate allocation decisions. Corporate water risk assessments influence or modify financial projections or their weighted average cost of capital assumptions. Scenario analysis modelling determines how much the market cap of companies would be impacted if they had to absorb more of the costs of treating their wastewater discharges, especially as drought intensifies and communities and regulators become less tolerant of water use and pollution. Hence a deeper understanding of the probability of large financial losses due to strategic risks related to water, such as not being able to grow revenue, access new markets, or develop new facilities is imperative. waterBeta, the methodology for LIMEYARD TSC Water Risk Index was developed by Professor Peter Adriaens of Equarius Risk Analytics LLC in collaboration with the University of Michigan. The assumptions which led to the creation of the methodology consider the following: 1) water as an idiosyncratic risk affecting industry sectors differently, 2) water resulting in a short-term, high impact price deviation and 3) water risk being highly correlated to climate and weather risks while incorporating quantity, quality and regulatory components. The index aims to capture core portfolio risk in securities from water exposures. Since no product or service can be manufactured and/or delivered without the use of water, every security and company is exposed to financial water risk which to date has had no viable tool to assess it. LIMEYARD TSC Water Risk Index’s objective is to capture excess short term non-systemic price volatility, to integrate geographically granular risk exposures in corporate productivity, efficiency and cost, and to weigh intangibles risk from water using unstructured data. Investor benefits include the participation in the focus on the companies’ excess volatility risk from water events, a rules-based and transparent method, and a factor investment strategy for portfolio risk diversification. Water security is the single largest investment opportunity. It is the foundation for healthy people, planet and profit. Water security investments ensure social and environmental returns, financial outperformance. In a water-secure world, investors, companies and cities understand that water is an essential and fundamental factor in practically all economic activities. They recognise its crucial role in mitigating and adapting to climate change and take transformative steps to increase its security. There is equitable access to safe and affordable drinking water, hygiene and sanitation for all, in line with the objectives of the UN’s Sustainable Development Goal #6. This requires significant and sustained water stewardship, water management and investment in water infrastructure to secure future water supply and access for all. Today’s smart investor isn’t just focused on profit, they want sustainability, impact and financial outperformance. Humanity and planet are facing colossal social and environmental challenges, but they provide great opportunities for wealth creation, democratisation and distribution. A water-secure world is at the heart of this matter. 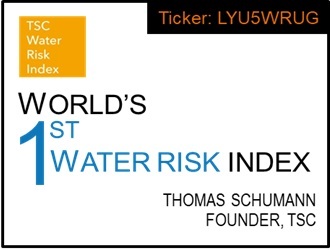 Thomas Schumann is the founder of Thomas Schumann Capital, who provides financial products and services to public, private and philanthropic capital to advance a water-secure world. TSC embraces social and environmental impact and responsibility, and financial outperformance. Thomas is a thought leader and expert in the water and sustainable finance space specifically related to water risk/water security. He loves trail running in the Santa Monica Mountains, is a nationally ranked masters long-distance runner, aspiring Ironman age group athlete. The purpose-driven life, meaningful connections with people, and acting as an agent of positive, global change is what drives him. Thomas values "Spirit, People, Planet and Profit", in exactly that priority. Cape Town’s ‘Day Zero’: Where Are We Now?